A United Launch Alliance Atlas V rocket launches on Oct. 2, 2015, from Cape Canaveral Air Force Station in Florida. The company's launch vehicles are a mainstay in the modern aerospace industry. ULA is itself a joint venture between the established aerospace companies Boeing and Lockheed Martin. 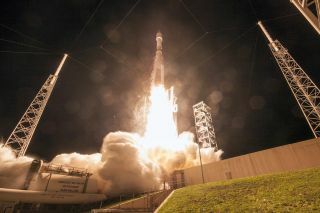 ULA boasts three families of rockets — Atlas V, Delta II and Delta IV — which have launched a combined total of more than 1,300 missions, according to the company's website. Two Bigelow Aerospace B330 modules are joined into an orbiting space station in this artist's conception of the company's expandable habitats.